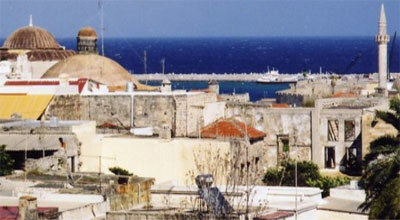 Rhodes is the main and by far biggest island in the Dodecanese. It has an area of 1400 km². Approximately 150.000 people live there. The capitol is Rhodes town. It is also the biggest town on the islands with 60.000 people living there. We recommend the City Centre Hotel in Rhodes Town, open all around the year. The old town is one of the most beautiful in Greece and protected under the UNESCO world heritage program. The old town centre is surrounded by a massive wall. It is up to 12 meters wide. One of the most famous events in the islands history was the siege by the Turks. The Turks actually tried twice. They wanted to secure their control of the Eastern Mediterranean. To achieve that goal they had to get rid of the "Knights of Rhodes" in their massive stronghold in the old town. That was easier said than done. The Ottomans failed in 1480 but finally succeeded in 1522. It took 6 months, countless battles and attacks until the Grand master of the knights finally asked for a truce and subsequently accepted Sultan Suleimans extremely generous terms. The knights left January 1st 1523 in full arms and with all their valuables and belongings. The same was offered to the residents but Suleiman also made clear he doesn't want them to leave. No church would be consecrated and if the people decided to stay they would not have to pay tax for 5 years. The sultan certainly was a most generous man especially when you consider how many men he had lost during the siege. Talking about it; another quite famous siege happened 305-304/03 BC. Back then it was Demetrios Polykletes, successor of Alexander the Great, and he failed miserably. As a result Rhodes captured a lot of booty and decided to spend it on a gift to their saviour the sun-god Helios. It was a big victory so it'd better be a big present. The decision was made to erect a colossal statue, bigger than anything the ancient world had ever seen. This way they could not only express their gratitude but also their pride. Erecting a bronze the size they had planned (30-35 meters) was quite a challenge. When they succeeded it became famous as the "Colossus of Rhodes" and was considered as one of the seven wonders of the ancient world. The Colossus is long gone although there were plans to re-erect it. Since no one knows how the statue looked like, not even where exactly it was built this could be an interesting project, very Greek indeed. Still there and absolutely gorgeous is the Rodini Park in Rhodes town. If you spent some time in Greece before you will appreciate it even more. It is shady and quiet, an almost tranquil place and perfect to take it easy for a while and let the worst heat pass on a sunny summer day. Lindos and its acropolis is the most popular destination for day trippers. It is about 50 kilometers away from Rhodes town. The best beaches however are on the east coast around Faliraki; needless to say that the area is extremely touristy. The further you go down south the more "local" the area becomes. Even on Rhodes you can find some unspoiled spots. 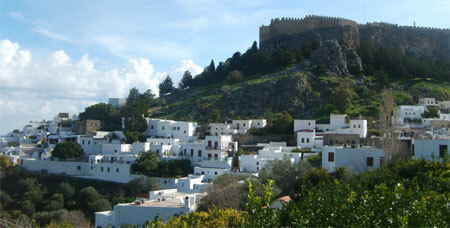 Hotels and apartments in Lindos can by found here. The exception to this rule is Prassonissi. The town at the southern tip of the island is an insider tip among surfers. I was told that Prassonissi may well have the best surfing conditions in all of Greece. As a result quite a few restaurants and holiday homes were built, the beaches here are still less busy than elsewhere. Public transport in Rhodes is quite good. There are frequent busses that go pretty much everywhere. 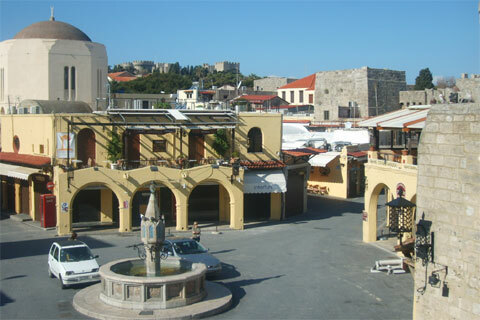 A good place to stay in Rhodes town is the "Rhodes Youth Hostel" in the old town. The camp site "Faliraki Camping" 2 km out of town is pretty good as well. My favourite place to stay in Rhodes Town is the City Centre Hotel (also good for long term holidays in the winter). 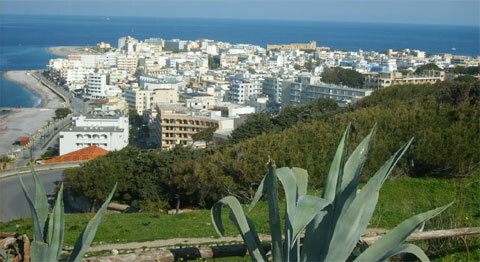 Most people on Rhodes stay in and around the tourist resort Faliraki. Faliraki is one of the biggest tourist areas in Greece. If you are not on a package hotel, you can find good accommodation in the Mon Repos Villa Hotel with double rooms for 30 to 50 Euro most of the year. More hotels and pensions in and around Faliraki, the party town on Rhodes, you can find here. Ferries: Rhodes has an extremely busy harbour. From here you can even get to Marmara (Turkey). The ticket is quite expensive though especially when you consider it isn't that far away. Of course there are frequent connections to all the islands in the Dodecanese, but also to the Cyclades Islands, Crete and Piraeus (the port of Athens). The ferry to Cyprus and Haifa (Israel) no longer exists unfortunately. Rhodes also has a busy international airport. Beside frequents flights to Athens and other islands in the Dodecanese there are plenty of charter flights from and to mayor destinations in Europe especially the UK and Germany; well at least during summer.